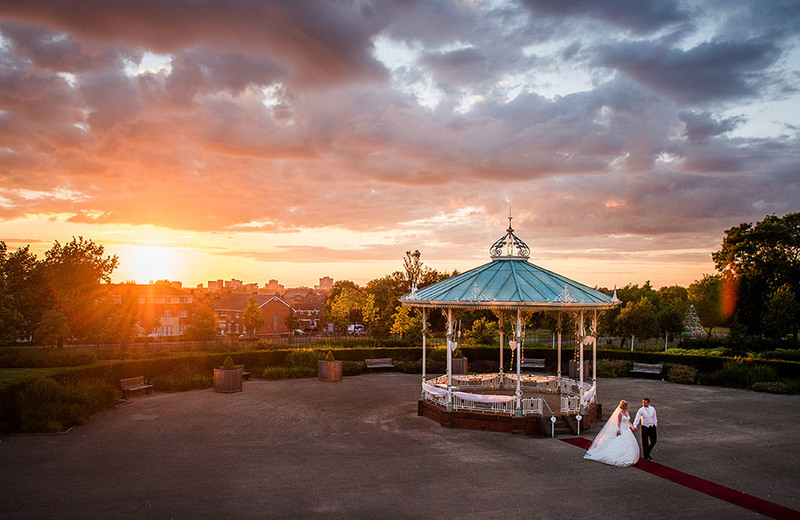 With the amazing fairytale bandstand to say your wedding vows and with the grand conservatory set behind, Paula Muldoon and Brian Lamb chose Isla Gladstone venue for their Wedding in June 2014. 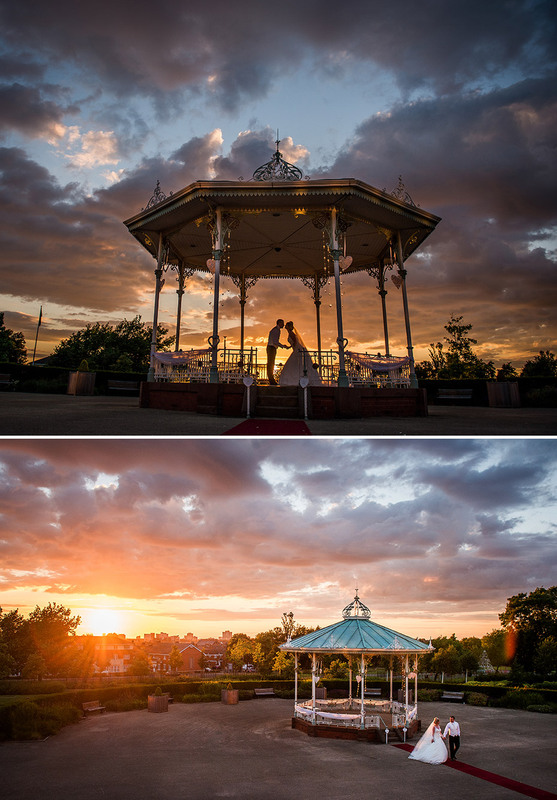 Over 200 years old, Isla Gladstone is a stunning venue nestled in Liverpool’s Stanley Park. As they met on a social media site, their wedding theme was ‘Twitter Blue’ complete with accent colours of blue and little Twitter birds. Paula and Brian wanted a Liverpool wedding venue that was beautiful and ideal for them to say their vows ‘al fresco’ style. Although it was a warm windy day, this added to the natural and romantic shots telling their story. The their day began, waking up at the same time, which was unusual due to being at different houses. Despite feeling excited and nervous, Paula received a gift from Brian, sending her a ‘one in a million’ glass filled with champagne. Although having a house full with her Mum, Bridesmaids, future Mother in Law and her Uncle Frank who walked her down the Aisle, it was a lovely calm morning getting ready. She had 3 hairdressers from Glam and Glitter, Russell and Browns and her make-up artist, Antonia from Icon Brides who helped get every one ready and left Paula feeling relaxed. Paula wanted her wedding dress to be a modern version of Grace Kelly’s, so she asked the renowned Philip Armstrong from Liverpool, who is an international designer to make her the gown she so desired and with her own shoes, Philip Armstrong tailored the details of the wedding dress to the wedding shoes making them unique. Based in Liverpool, Philip Armstrong has designed dresses for a host of celebrities and is a sought after name as his brand grows. Brian’s suits were from The Wedding House in Liverpool and Bridesmaid dresses from Bridal Path, keeping in line with the Twitter Blue theme, using Calla Lillies from Sentimental Moments in Liverpool for her wedding bouquets. Paula’s cake was made by request, as Paula posted on Facebook her story of how they met and her friends were in tears after reading their love story, so they offered to make her wedding cake for her, which they had to get the cake cutters made to keep the Twitter Theme. She also made cupcakes for every guest which they enjoyed in an afternoon tea delight. The most memorable day for Paula and Brian besides saying their wedding vows to each other and the wedding party dancing the conga line to Love Train, Paula says, “A white feather fell onto her father-in-laws hand when her late father’s favourite song was playing and although they were indoors, and no feathers were used on the tables, it was a surreal moment”. Paula and Brian’s wedding has been entered for Wedding of the Year 2014 and got through to Round 4 stage of the competition. Winners are announced in January and they will be entered to National Wedding of the Year. To read about there fabulous story of being chosen as a entry into wedding of the year, click here.